Contrary to popular belief, most of the world’s chickens don’t speak with a sputtering Southern accent. But thanks to a couple of high-profile cases, strutting around in a White Rooster Costume like this will make people leap to the conclusion that you’re either a plucky attorney or a witness for the defense. And either way, the opposition looks like they’re out for blood. So you’d better prepare to grill or be grilled! Just kidding! Anybody who knows a cockscomb from a hole in the ground will tell you that a fair fight is way more likely to end with a man-eating chicken than a man, eating chicken. So play their little games if you want, but when push comes to shove don't forget that you’re no mere featherweight. They’re dealing with a real bantam! And always remember that your ancestors were dinosaurs. That’s right: underneath the urge to peck at the dirt like a birdbrain lies the single-minded grace, purpose, and efficency of a velociraptor pack closing in on its quarry. Can you feel them calling to you from across the eons? Hey, quit crowing for a second and just listen! There! Can you hear them now, squawking and chirping like a pandemonium of parrots? They’re speaking an ancient tongue, using the name given you by Destiny itself! Fear nothing, they say, for they know that in your powerful thighs, scaly toes, and cruel talons, they are immortal! Fear nothing, they say, for they are certain that the winds of fate will ever be at your back! Now go! 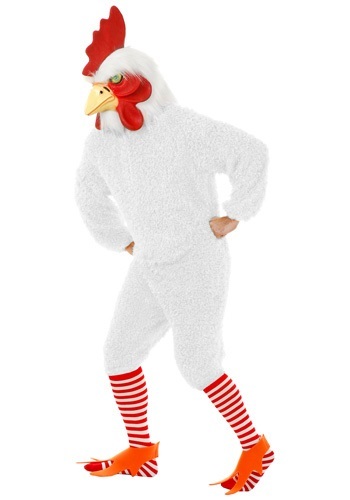 Put on this costume and become what you were born to be!